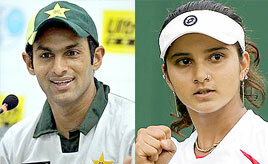 According to reports, Shoaib’s mother met Sania’s parents in India and accepted her as future daughter-in-law. The Valima or reception is expected to be held in Lahore on April 16 or 17. Sania and Shoaib fell in love some six-and-half months back and it could be the reason for the breaking up of Sania’s engagement with childhood friend Sohrab Mirza. Watch 11th Episode of Living on the Edge on ApniISP only! Do you want to watch more Episodes with other Celebrities? Watch 10th Episode of Living on the Edge on ApniISP only! Promo of song Aye Khuda from movie Paathshaala starring Shahid Kapoor & Ayesha Takia. Watch 9th Episode of Living on the Edge on ApniISP only! Promo of song O Girl from movie Housefull starring Akshay Kumar, Ritesh Deshmukh, Arjun Rampal, Deepika Padukone, Lara Dutta & Jiah Khan.